I now think maybe that’s how all birthdays should be celebrated! Happy Birthday, Renee! I hope I can have a piece of your virtual cake. HAHAHAHAHHAHAHAHA! I love this. You are awesome. I’m sensing a little anger at Hello Kitty however. Maybe you should see someone about that? Awesome! 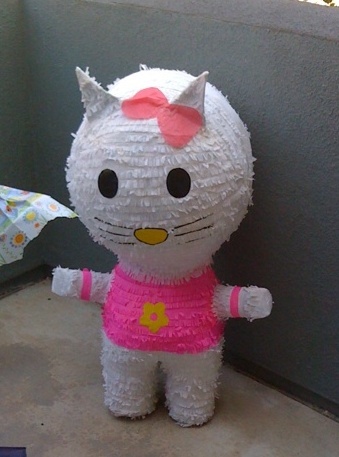 I love pinatas and the thought of beating up Hello Kitty to get some treats sounds really fun. Thanks so much. You didn’t mention that she stands 3 feet and can easily hold 10lbs of her favorite candy. PS. Wonderful grandmother just purchased a new piñata, Kai-Lan…haahaahaahaahaaa! That was flipping hilarious. I’d write LOL, because I truly am, but I can’t remember whether you are one of those people that hates LOL, or one who likes LOL, or one who doesn’t care. I can’t keep up. But if I have to guess, having actually met you at BlogHer, I’m going with – you don’t care about the use of LOL. This definitely makes one think a little bit more about this “traditional” experience of beating a paper mache animal for celebratory reasons. And humorous, great post!